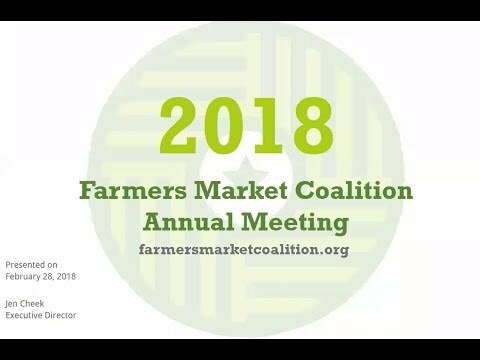 The Farmers Market Coalition is a 501(c)(3) nonprofit dedicated to strengthening farmers markets across the United States so that they can serve as community assets while providing real income opportunities for farmers. The Farmers Market Coalition is driven by three complementary goals. We call it our triple bottom line. Farmers earn fair prices for the fruits of their labor by selling directly to consumers. Consumers gain access to fresh, nutritious, local produce. Communities regain a figurative “town square,” experiencing the many positive outcomes of foot traffic and animated public space. Throughout the USA, farmers markets are achieving these goals. Some are doing it better than others. While we too are dazzled by the bigger markets which assemble hundreds of vendors and thousands of shoppers, size is not our only measure of success. Sometimes, it is the smaller farmers market operating in a challenging neighborhood that achieves this triple bottom line. To serve as an information center for farmers markets. To be a voice for North American farmers market advocacy. To foster strong state and regional farmers market associations. To bring private and public support to the table to sustain farmers markets in the long term, for the benefit of farmers, consumers, and communities. To promote farmers markets to the public. To develop and provide educational programming and networking opportunities for farmers market managers and farmers market vendors. Many agencies and groups support farmers markets – cooperative extension, food security advocates, departments of agriculture, and a host of nongovernmental organizations. The FMC supports these efforts in serving as a central hub from which to locate allies, identify and share best practices, and positively impact public policy pertaining to farmers markets. See an overview of FMC’s great work in the 2015 Annual Member Meeting Presentation (pdf). See the webinar recording here.